Lawrence Harlen "Larry" Barlowe, 81 of Morristown, TN passed away at Fort Sanders Regional Medical ¬Center Wednesday, February 14, 2018. 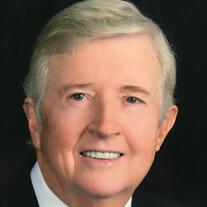 Larry was an involved member of First United Methodist Church in Morristown where he served on multiple committees and enjoyed home visits with prospective and elderly members. Larry was a retired Major, United States Marine Corps and from Jefferson Pilot Financial Insurance Company. He was a graduate of Berea College and was an Eagle Scout. He is survived by his wife of 21 years, Margie Barlowe, brothers Frank Barlowe and Amberse ¬Barlowe (Patsy), sisters: Frances Dillingham, Edith Hollifield and Goldie Condrey; daughters Denise and Vicki, son Jeffery, step sons Blain Potter (Lindy) and Paul Lauritzen (Trisha), step daughters Donna Potter and Celia Potter Clark, grandchildren Joshua Milligan, Abby Smith (Adam), Kaley Moore (Leslie), Hunter Clark (Alyssa), Ryan Willis, Caroline Potter, Andy Potter, Christian Lauritzen and Emma Lauritzen, great grandchildren Fenix Clark, Fallon Clark, Riley Clark, Drake Moore, Aly Willis and Addison Willis. There will be a memorial service at 11:00 A.M. on Tuesday, February 20 at First United Methodist Church in Morristown, TN. An interment service will be held at 12:00 noon on Wednesday, February 21 at the Western Carolina State Veteran's Cemetery in Black Mountain, NC. The services will be conducted by Reverends Darris Doyal and Walter Weikel. In lieu of flowers, the family requests that memorial donations be made to the Wounded Warrior Project at woundedwarriorproject.org/donate or to First United Methodist Church of Morristown, TN. 101 E. 1st North St.